Want to keep your coffee hotter and your iced tea colder? 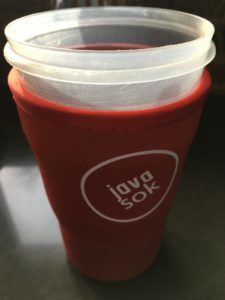 Java Sok has you covered. The size showing in the picture is your basic large or extra-large for any commercial drink on the market and it works better than advertised. Your hands stay at room temperature no matter the type of drink too. I drink unsweetened iced tea almost every day and this kept mine cold for more than two hours. Unlike some competitors or freebies, you might get as a premium, these are very spongy and thick. Great on the go or at home. Mine will be used daily. They have varied sizes and colors to meet your needs. They even have camouflage for the outdoor lovers who may be reading this. They need to be hand washed and air dried.